I received some devastating news last night. If you own birds and live in Southern California please read this as it affects you. My aunt Lin also keeps birds. She has a flock of Fischer’s lovebirds, several tame chickens and two ringnecks, one of which used to be a pet of mine. Normally whenever there’s a family function we seek each other out to see how the other’s flock is doing. Last night (Christmas 2002) she almost seemed to be avoiding me. I thought perhaps she was just exhausted from the holidays and work. A few weeks ago my cousin Liz had told me that someone in Lin’s neighborhood had caught Newcastle and now the government was trying to euthanize Lin’s birds. Supposedly she had been trying to get a court order to protect them. I had been meaning to talk to her about it and towards the end of the evening I finally caught her alone and asked her how the birds were. She told me they’d all been killed and not one had been tested for Newcastle. Someone in the neighborhood got Newcastle and all his birds were euthanized. The surrounding neighborhood was quarantined, and birds were not allowed to be transported out of the area. The CDFA came in and went door-to-door asking people if they had any birds and could they have a look at them. They said no flocks would be euthanized unless they tested positive for Newcastle. Lin and Mike cooperated fully, wanting this outbreak to be over as much as anyone else, and allowed officials to come in and inventory their flock. The CDFA then says that all birds within a ½ mile radius of the infected neighbor will have to be euthanized. A town meeting took place, in which many residents showed great concern for the safety of their birds. My aunt calls a hotline the officials have given residents. She tells the woman on the phone about her fear that her flock will be euthanized. The woman says they will be, since "they’ve been exposed." "How do you know they’ve been exposed?" "But you can’t euthanize them without testing, can you?" "We can do whatever we want." Lin then tells the officials that they’ll have to get a court order to euthanize her birds. They obtain a court order and present it to Mike while Lin is at work. Mike said they were very nice about it and he did not read the order. All of Lin's birds were caught up and placed into transparent bags, then gassed with portable CO2 cylinders. * Lin came home after it was all over. She read the court order, which only gave them permission to INSPECT the birds for signs of the disease. Any sick birds would of course be euthanized. In addition, the order only gave permission to inspect outdoor flights and enclosures, NOT their private residence (the house) AND it allowed the owner three days to request a hearing to challenge the order. Unfortunately, Mike took their word for what it said and let them kill everything. 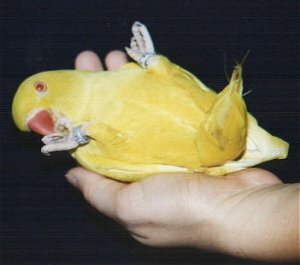 None of the birds were tested for Newcastle, either before or after being euthanized. Do NOT let this happen to you! The government is currently taking advantage of the people willing to cooperate. You have RIGHTS. Do NOT give information freely- not the number of birds you have, IF you even have birds, etc. Do NOT invite them onto your property. If they want to see your property, make them get a court order to do so. READ any documents they show you thoroughly. Get a LAWYER if you can. COMMUNICATE with your neighbors and stick together. Make sure everyone in your household is INFORMED about what to do if officials come knocking. Call the AFA and find out what other rights you may have and let them know immediately if such rights have been violated. I realize that the government is only trying to stop the outbreak, but their methods in doing so have been underhanded thus far. They have deliberately withheld information and lied to the people they should be trying to help. Few bird owners would object to euthanasia IF THEIR BIRDS TESTED POSITIVE FOR NEWCASTLE, yet the government is not even testing. We should not have to hide our birds like Anne Frank from the gestapo. * This sentence has been edited yet again on 1/17/2003, after speaking with my uncle. He witnessed the event and has confirmed that this was the method used. He also witnessed officials using pellet guns to shoot escaped chickens around the neighborhood. Articles and images contained on this site are © 2002 by Karen Trinkaus unless otherwise noted and may not be reprinted or used in any way without the author's permission.